A shop vac is basically a more powerful version of the regular vacuum cleaners used in homes, featuring a high-powered motor and other enhanced features. Most people associate this tool with cleaning up construction and woodworking sites, but it can also be a good car cleaner. With its powerful suction force, this tool can get rid of dirt and debris that is hidden deep in your car’s interior crevices, and some can also pick up liquids, leaving the interior sparkling clean. However, since there are several types of shop vacs, it is important that you get the right one that is perfect for car cleaning. To help you with this, the review below looks at 7 of the best shop vacuums for cars, showing the features that make car cleaning a breeze. This product is the top-rated vacuum for cars because of its powerful dual-turbo industrial 2-stage motor that delivers a powerful suction force, all while operating very quietly because a noise diffuser is built in to cancel out most of its noise, leaving only 74 decibels output. A remote on/off switch is included in the pack for convenience and easy use, and other accessories include a 10-foot flex hose for getting to all the corners of your car, 11-foot standard hose, 20-foot power cord, 2 extension wands and a crevice tool among many others. Functioning as both a wet and dry vacuum, it is easy to switch between the two by simply attaching a cartridge filter for dry vacuuming then switch to a foam filter for wet vacuuming. This makes it one of the best wet dry vacuums for cars. However, a fine dust filter is not included in the package and must be bought separately in order to pick up fine dust or ash. Affordable and lightweight are just a few words to describe this ArmorAll utility shop vac. Though it is equipped with quite a small 2.5-gallon polypropylene tank, this results in a compact design that is also very lightweight for easy portability. 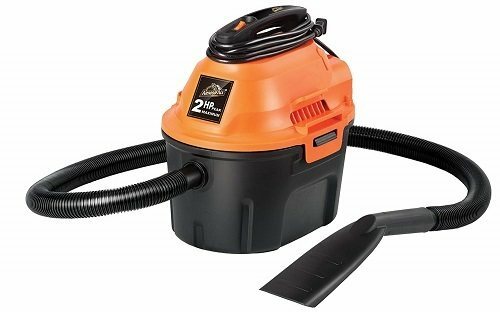 The wet and dry vac unit has a 2.0 peak horsepower motor that has ample suction power and can be easily converted into a blower. A built-in noise diffuser ensures that the motor’s operation is shushed for efficient and quiet running. For an even more efficient running, this appliance is equipped with an auto shut-off function, which detects if the tank is full, then proceeds to power off to prevent overflow and power wastage. 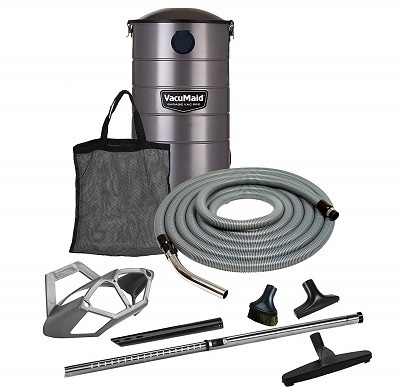 Other features include a 6-foot hose, 10-foot power cord, crevice tool, blower nozzle, 2-in-1 utility nozzle, and a reusable cloth filter and foam sleeve for dry and dry vacuuming respectively. VacuMaid’s GV50PRO has a durable galvanized steel construction that is powder coated for corrosion-resistant lifetime use. However, what stands out most is its large, 7-gallon tank, which gives you an extended use without continuous emptying. Like other shop vacs, this one comes with several attachments and they include a long 50-foot flex hose for extended reach, a wall mounting bracket, hanger, storage caddy, telescopic and curved wands, dusting brush, floor, and upholstery tools. The unit also uses sealed HEPA style bags that do not mess up the cans or eliminate the process of filter cleaning. Another benefit with this product is its wall mounting capability, which is easily done using a hanger bracket. This keeps the entire cleaner away from the floor, saving on space and eliminating clutter or untidiness in your garage. Cost is the only limiting factor as this unit is very expensive. However, it has the features to show for it. 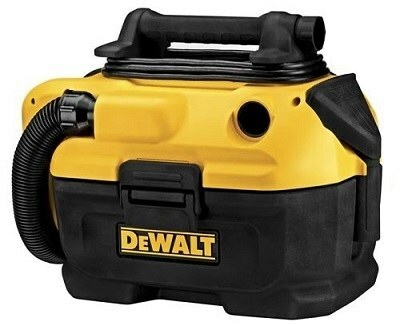 If portability is a big factor, then this DCV581H from DeWalt should be on your radar. This is because it can operate using an 18 volt or 20-volt max battery, enabling you to move practically anywhere as you do the cleaning. You can also hook it up to the mains as it has an AC option and this makes it one of the most flexible and portable shop vacuums for cars. However, the battery and charger are not included and must be bought separately. HEPA rated filter traps are used for dust trapping (with a 99.97% efficiency) while a washable and reusable HEPA rated wet/dry filter makes it a versatile wet and dry shop vac. Other features include a heavy-duty crush-resistant, fully integrated 5-foot hose, crevice tool, wide nozzle tool, onboard storage for easy transport and blower conversion. Considering suction power, Ridgid’s VAC 4010 outperforms the rest because it is equipped with a powerful 6 horsepower motor, making it the most powerful and consequently, the best heavy duty unit in this review. 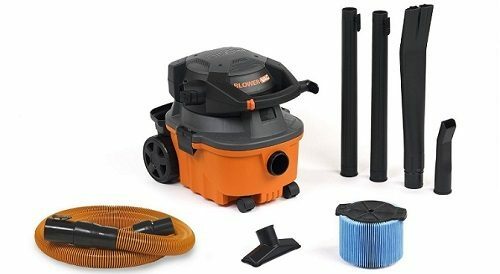 The power of this motor can be used for wet/dry vacuuming or be converted into a blower, giving it a high versatility factor for multifunctional use. For movement, large wheels are attached at the rear to give it some portability and this is a big plus considering that the unit is quite heavy. Maintenance is simplified by the use of a Qwik-lock filter, which installs and removes easily by snapping on and off. This makes filter changes a breeze as no tools are required. Other features include utility and car nozzles, two extension wands, a storage caddy and an 8-foot pro hose that is very durable and locks securely to the vacuum. 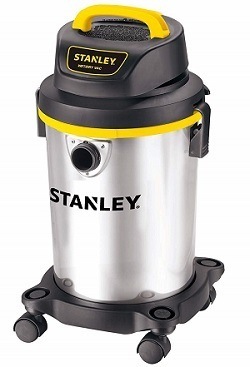 Stanley’s wet/dry vacuum has a lightweight, compact design, making it highly portable, and this is enhanced by a carrying handle and 4 swivel casters that make the whole unit easily maneuverable in all directions. Apart from this, the unit has a 10-foot cord and a 5-foot hose, which, when combined, extend its reach, although the hose is quite short. However, the long power cord compensates for this deficit and after use, a cord wrap design makes it easy to organize the cleaner for storage. Accessories included are 3 extension wands, a crevice nozzle, utility nozzle, floor brush, foam filter, reusable dry filter and foam filter. With a tough and durable stainless-steel tank as well as a relatively powerful 4.5 peak horsepower motor, this shop vac is ideal for heavy-duty cleaning, and it is equipped with swivel casters for maneuverability and portability. 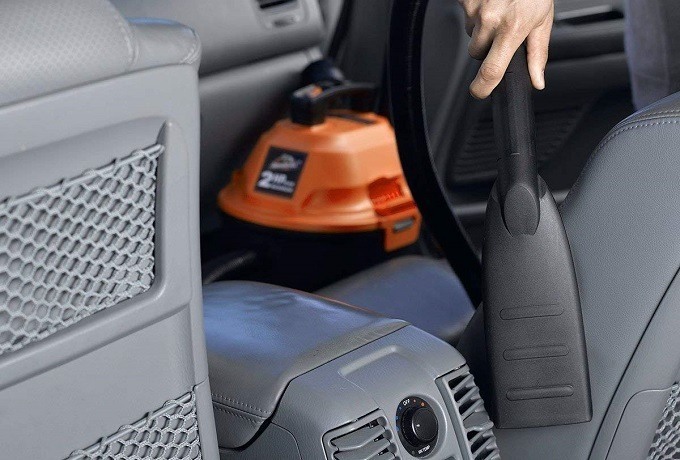 Top and side carrying handles enhance the shop vac’s portability by making it easy to carry while a secure latch system ensures the tank and lid are fused together, preventing any mishaps when moving or operating it. A rear blower port is built in for converting the motor into a blower, which is ideal for pushing out dirt from crevices and other hard to reach in your car’s interior. 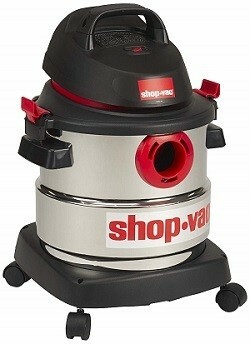 Combined, these features make it the best professional shop vacuum cleaner. Other features include a 7-foot hose and 3 extension wands for reaching out, a crevice tool, floor nozzle, gulper nozzle, cartridge filter, foam sleeve and a 5 to 8-gallon disposable filter bag, all being part of the shop vac as accessories. A shop vac’s power, often measured in horsepower for corded units or volts for battery-powered units, is important as it gives you a measure of its suction power. As such, you should go for the highest horsepower or voltage rating that fits your budget as it will clean more efficiently. The manner in which your vacuum is powered affects its maneuverability. If you don’t want to worry about recharging, consider vacuums that come with a cord. However, if you want better portability, it would be good to purchase one with batteries. For the corded cleaners, it is always best to have a long power cable as well as a long flex hose so as to improve on the reach. On the other hand, for battery-powered units, check on the battery life and battery level indicator. It is quite annoying to be interrupted in the middle of your work for a recharge. Generally, large tank shop vacuums are better because they afford you an extended use with minimal tank-emptying interruptions. However, the larger the tank, the bulkier, heavier and also, the more expensive the product. 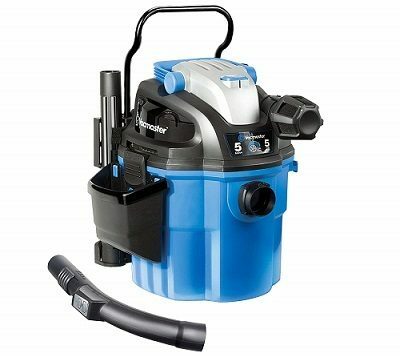 Cleaners with small tanks have the benefit of being more affordable, compact, lightweight and highly portable, but they fill up very quickly and thus, require frequent emptying. Buying Guide: for commercial use, a large tank is recommended so as to accommodate the large quantity of dirt. However, for domestic home use, a small-tanked cleaner will do. This is a no brainer. The quietest shop vacuum for cars is the best to use because no one likes loud noises as they are irritating, and especially if they come from such a machine. Measured in decibels, the noise level should not exceed 70 dB, otherwise, it will be very annoying. Features to check for include noise diffusers, which help in canceling out the excess noise. The attachments that shop vacs come with are important to consider because they impact the performance and usability of the product in one way or the other. For instance, since cars have different surfaces (soft and hard surfaces), look for a multi-surface vacuum that comes with multiple brushes, crevice tools, and wide nozzles so as to clean the vehicle in its entirety. 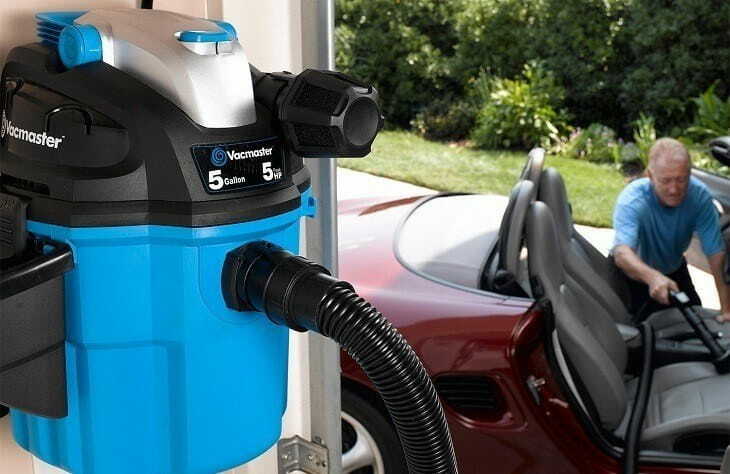 In the case of shop vacuums for cars, the ease of use factor usually entails a number of things such as high portability for easy movement around the garage as you clean or long flexible hoses for easy reach throughout the entire car as the appliance is stationed at one point. Other things such as a long power cord also extend the reach for ease of use while easily disposable or reusable dirtbag filters simplify the task of getting rid of the collected waste while also being more hygienic to use. All in all, ensure that the product has all the convenience features that make it easier for you to use. To finalize, the convenience provided by shop vacuums in cleaning cars is unmatched. These products are very handy tools and as you can see above, most of them can dry vacuum and wet vacuum the car’s interior, making them very versatile. However, since every person has different needs, this shop vacuum for cars review outlines the defining features of each product and at the end, you should be able to easily select the best shop vacuum for cars that is suitable for you after carefully reading through.